Since 2010, Zach Wolfson has been going above and Beyond the Gallery to bring the artistic process and creative storytelling to the forefront! Wolfson's love for education and filmmaking is what inspired him to create Infusion5; 'A site for you: For motivation, inspiration, creative enrichment…For those days when you need a kick in the pants to push through on a project…Or simply for insights directly from another creative’s approach to their work, who may or may not share in your creative discipline.' In the age of social and new media when the noise feels difficult to cut through, Zach welcomes the challenge and takes hold of these new tools to focus on authenticity and quality; digging deeper into what makes an artist tick. 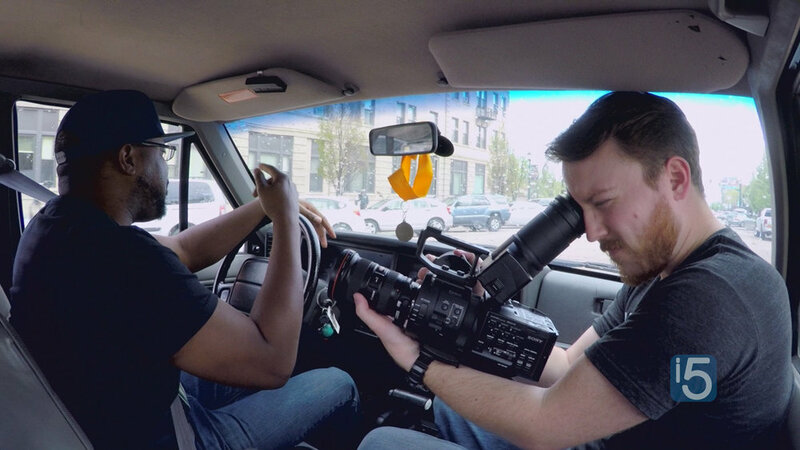 Zach filming with performance writer Idris Goodwin in downtown Colorado Springs, CO during season 3. Photo by Bob Wolfson. When/Why did you start Beyond the Gallery? I launched Beyond the Gallery on November 11, 2010. The episode I published that day was one of four pilot episodes I made with artist friends to experiment with the concept and see if I could make it into something. I started Beyond the Gallery because of my parents. As kids my sister and I grew up in a home full of an appreciation for art and aesthetics. Over the years our mom and dad loved to visit the art markets in Santa Fe, and when they got home from those trips they’d tell us about the art they experienced. I remember noticing my dad would light up especially when he shared a story or two about meeting artists and getting to ask them questions, even if it was only for a few minutes. Fast forward to 2009 – I was 2 years into my filmmaking career making videos for clients, and I began to follow the Bay Area tech scene as I built my own business here in Colorado. I listened to podcasts and watched web series, and I noticed a trend: Most of the shows were about technology, and there wasn’t much out there about creativity and creative people. It was here that I began to connect the dots between my parents’ fun stories meeting artists and what I thought might be an opportunity to create a similar experience for people online through video, all while helping artists share their stories and sell their work. Now 7 years later, I’ve had the privilege to collaborate with and feature 49 creatives on Beyond the Gallery. What inspired you to highlight other creatives? I simply love working with other creatives. It energizes me. We may work in different media and express ourselves differently through our creativity, but there’s a synergy that can happen when we collaborate and we share in creating something. Above: Zach and Bob preparing the interview setup with performance artist Armando Silva at his studio in Greeley, CO during season 3. Photo by Bob Wolfson. 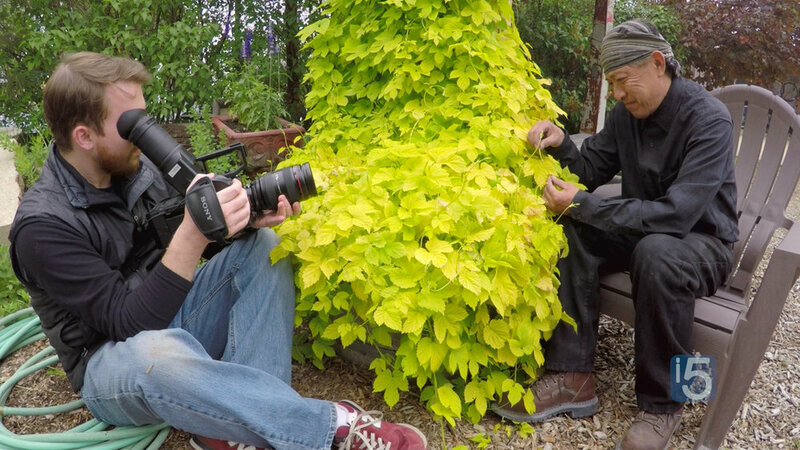 Zach filming with bronze sculptor Yoshitomo Saito at his studio in RiNo Art District in Denver, CO during season 3. Photo by Bob Wolfson. You have such a wide variety of artists and personalities on BTG. How do you find the creatives you highlight? First, let me say I really owe the variety of creatives featured in the series to Margaret Hunt and her team at Colorado Creative Industries. I started Beyond the Gallery with a focus on visual artists. By 2013 I was building toward producing the second season when I met Margaret, and I quickly realized that we share a drive to support and empower creatives across Colorado. With that common ground, Colorado Creative Industries came on to sponsor episodes featuring creatives in Colorado communities that they have certified as Creative Districts. Their support as a sponsor has inspired me to grow the series from taking people beyond the gallery walls and into artists’ studios, to celebrating creativity across many disciplines and industries. My process to find creatives to highlight involves reaching out to local communities and inviting creatives to apply for the show. There's such a talented, diverse variety of creatives in Colorado, and I feel lucky to be a part of it. Zach filming with urban designer Kevin Yoshida at his studio in 40 West Arts District in Denver, CO during season 3. Photo by Bob Wolfson. How long does it take you to make one episode? I produce Beyond the Gallery seasonally, so the time to make one episode is not quite a linear process since we’re making a collection of episodes at the same time. Altogether though it takes about one to two weeks total to make an episode, or three to six months to produce a season. What are your goals for Beyond the Gallery? My big goal with the series has been to help creatives share their stories and connect with people online through video. I believe video is the best way for us to share our work and build relationships with our audiences online. And promoting ourselves (no matter who you are) is really hard, so my hope for our featured creatives is that being on the show strengthens their voices and gives them a space online to share their perspectives. Zach filming with art teacher Cynthia Barnes at her art studio in downtown Longmont, CO during season 3. Photo by Bob Wolfson. What are you most excited for in Season 4 of Beyond the Gallery? To get to feature so many female creative entrepreneurs. There are so many amazing creatives with unique approaches to their work in our state. I am excited to be able to offer a platform for so many strong female creative voices this season. I'm also thrilled to continue to connect with and highlight creative communities throughout Colorado. I never know where the next season is going to take us, or what kinds of creatives I am going to learn from next (until we start pre-production of course). So that’s always exciting to me. Plus I love it when we get to feature someone who works in a creative discipline that we haven't explored yet. Anything else you want to share, upcoming goodness? Through the creatives I've worked with on Beyond the Gallery, as well as those who watch the show, I've met many people interested in making their own videos as a way to share their creative work, why they do what they do, and even to teach what they know. But they don't know where to start. This is why I started Start Small with Video. It’s an instructional series all about using what you already have (your smartphone), having fun, and being intentional with the videos you make. I plan to continue to grow that content so people have simple, actionable steps to get started sharing their creative world through video.